The easy-to-sell, easy-to-install upgrade to the most popular Rack and Pinion steering system in boating. SeaStar Solutions® has applied its patented No FeedBack technology to the incredible precision of a rack and pinion system, and engineered-in serious advances in steering comfort and control. And — it’s a drop-in replacement for SeaStar Solutions® “The Rack”. NFB Rack single-cable systems are suitable for most single-station boats with a single non-power-assisted outboard engine up to V-6 and minimal engine flutter or steering instability. NFB Rack accepts wheels up to 16” diameter. New Back Mount design means easy installation; helm & cable are installed as a unit from behind dash and replace standard SeaStar Solutions® rack steering without dash modifications. • Precise feel of 4 turns from lock-to-lock. • Minimal clutch free play. • Standard 3/4” round tapered steering wheel shaft. • Kits include: cable, helm, 90° bezel and hardware. 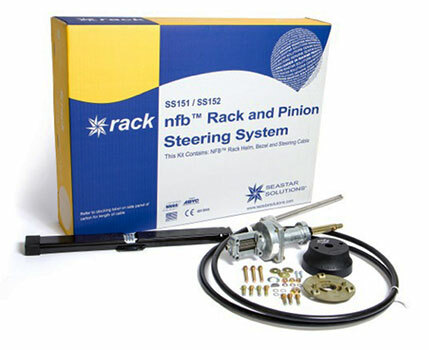 The only Rack and Pinion steering system for the high performance boater. SeaStar Solutions® combines its patented No FeedBack technology with the incredible precision and control of a dual cable rack and pinion system. Now more than ever, NFB means performance! SeaStar Solutions® offers Pro Rack for high performance hulls and motors — boats which have engine flutter, experience instability or simply need that extra margin of control at the helm. It’s a drop-in replacement for SeaStar Solutions® “The Rack”. NFB Pro Rack systems are suitable for single-station, high performance boats equipped with a single non-power-assisted outboard (up to V-6) in which engine flutter or steering instability is present. NFB Pro Rack accepts wheels up to 16” diameter. New Back Mount design installs easily and replaces standard SeaStar Solutions® rack steering without dash modifications. • Patented NFB (No FeedBack™) Steering helm. • Dual cables minimize lost motion in system.